Fresh limes are a staple for cooking Thai food, and fortunately these are available on a year-round basis for a reasonable price. Look for limes that have nice thin skin and heavy feel which indicates good juice content. Before slicing the lime, apply pressure with your palm and roll on the countertop to release juices. These require lime juice because it provides the "piquant" or sour component which mixes with chile heat. For vegetarian, we like lime juice in Thai Vegetarian Larb Woonsen, "Larb Woonsen Jae". Fresh lime actually cooks beef in our recipe for Lao-style Larb. Many other Thai recipes use lime juice as well, please visit our recipe index. Surprise your friends with a great snack by mixing fresh lime juice with fish powder w/chili, a bit of fish sauce & then serve mixed up with steamed jasmine rice. Limes are more sour than lemons so it's best not to substitute. 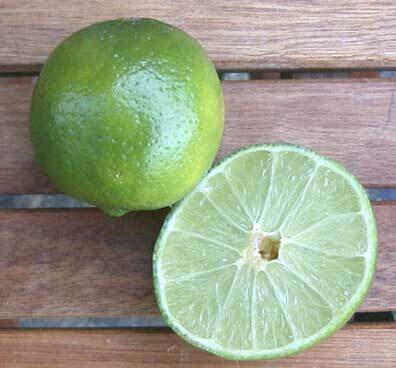 Most desirable limes found in USA are from Mexico although there is domestic production as well. Also see our recipe for a thirst-quenching fresh Limeaid. and our papaya margarita recipe.